Nearly all of our recordings represent an aspect of the history of fiddling in North America, and many recordings feature fiddle tunes and styles that have substantially died out. A Project in Celebration of the Lewis and Clark Bicentennial! There were two fiddlers on the Lewis and Clark expedition as they explored and mapped the route between St. Louis and the mouth of the Columbia River in 1804-6. The fiddling and dancing helped to maintain the morale of the men and to establish good relations with the Indians. This CD presents popular airs & dance tunes which were probably known by them, played on fiddles, banjo, guitar, harpsichord, and percussion by noted Missouri fiddler and historian, Dr. Howard Marshall (fiddle, fretless and fretted banjo); champion Northwest fiddler and historian, Vivian Williams (fiddle, harpsichord); champion Missouri fiddler John Williams (fiddle, percussion); and noted Northwest traditional musician, Phil Williams (guitar, mandolin). Many of the selections feature just two fiddles, with one fiddle backing up the other, and simple percussion. Recorded live in stereo to preserve the natural acoustic sounds of the instruments. Included is an informative booklet with histories of tunes and information about music on the expedition. At the end of a long day on the Oregon Trail, the pioneers often played musical instruments, sang, and danced on the prairie beside the covered wagons. Here are some of the tunes mentioned in their diaries, as well as other popular dance tunes of the era, played in old time style on fiddle, guitar, banjo and accordion. Phil and Vivian Williams grew up near the end of the Trail, have known tunes and dances of the Pacific Northwest's pioneer heritage since childhood, and are founding members of the Washington Old Time Fiddlers Association, which was formed to perpetuate the pioneer music of the region. The liner notes discuss the history of these tunes. Dancing was one of the most important recreational activities for pioneers in the West. They danced squares, waltzes, mazurkas, schottisches, polkas, and Virginia Reels. 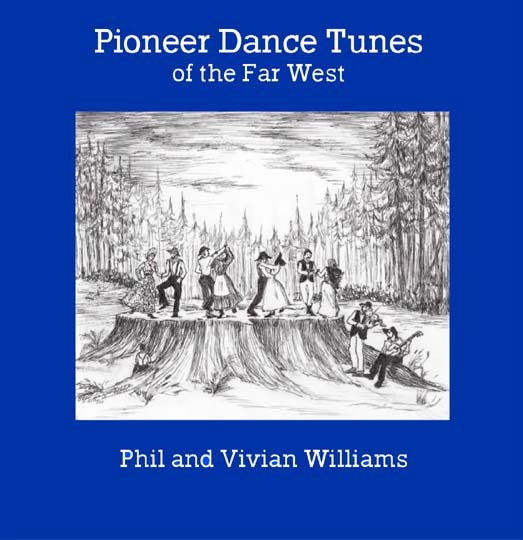 Here are some of the many and diverse tunes played for dances in the Far West in the 1850s, 1860s, and 1870s, performed by Phil and Vivian Williams on fiddle, guitar, banjo, mandolin, and other instruments used in pioneer dance bands. Many of the tunes are well known while others are hardly known today at all. Some of the tunes commonly played today without all the original parts are performed with all parts as originally written in the 19th century. The selections offer a rare insight into the broad range of tunes danced to in the Far West over 125 years ago. 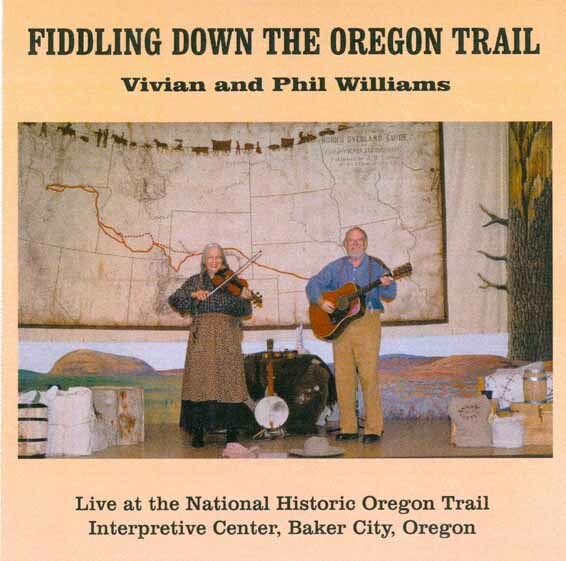 This CD is the result of extensive research into the tunes from the region's pioneer heritage by Phil and Vivian, who grew up in the Pacific Northwest playing and dancing to many of them. 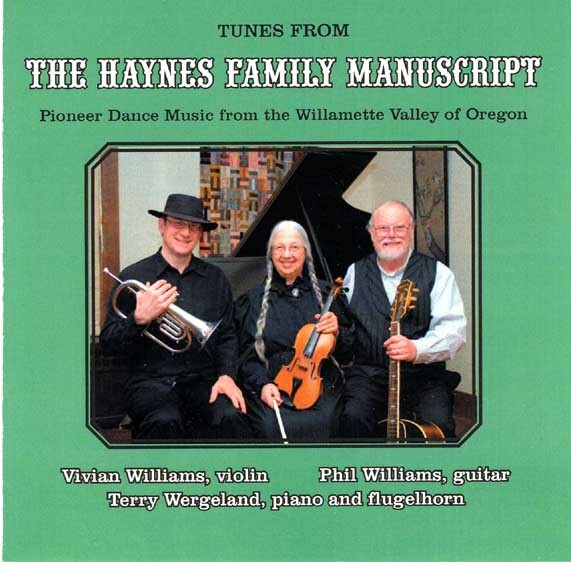 The Williams have played traditional music together for over forty-five years and are well known in the West as music scholars and performers of the its old time dance music. The booklet with the CD contains extensive liner notes on pioneer dancing in the Far West and background of the tunes. The fiddle was the principal dance instrument on the Oregon Trail. Vivian and Phil Williams have been presenting this program of fiddle tunes played on the Trail for several years. This CD is a complete program with the tunes, journal accounts, and tune histories as presented and recorded at the National Historic Oregon Trail Interpretive Center, Flagstaff Hill, Baker City, OR in July, 2007. Besides being a champion fiddler, Vivian has a BA degree in History from Reed College and an MA degree in Anthropology from the University of Washington. She and Phil are regarded as among the foremost researchers and performers of the fiddle and dance tunes of the Pioneer West. This program will make your feet tap and give you information about life on the Trail, the tunes, and the dances that can be found nowhere else. In 1862, gold was discovered on Warrens Creek in Idaho, about 40 miles NW of present McCall. The resulting gold rush brought over 5,000 miners to "Warren's Diggins," mining camp. A flute player named Peter Beemer started collecting and writing down tunes for a dance band he was forming. He had folks hum or sing their favorite dance tunes, got some tunes from itinerant music teachers coming through the camp, and other tunes from musicians who had come to Warrens. These tunes were written on foolscap paper by hand, Mr. Beener hand ruling the staves. He developed a manuscript of 124 tunes for his dance band to play for the regular Saturday night dances at the tavern of fiddler Peter Bemis. The band was composed of two fiddlers, flute, button accordion, banjo, and an unidentified sixth member. The manuscript survived, and was discovered and published by Vivian. It is the only manuscript of what a dance band actually played for dancing in the West in pioneer times. For more information go to The Peter Beemer Manuscript. The tunes are for the dances of the day - quadrilles, polka, schottische, waltz, mazurka, varsouvienne, and other ballroom dances of the period. The music ranges from a few well known square dance tunes, to challenging tunes, most of which have not been familiar to fiddlers for many decades. This recording presents a selection of 25 of the different types of tunes in the manuscript. See the Liner Notes for more details. These tunes were played for dancing in the Willamette Valley, Oregon, in pioneer days. They come from The Haynes Family Manuscript, which was written by, played from, and handed down through several generations of the Haynes, Shuck, and Adams families. They came to Oregon over the Oregon Trail in the middle of the 19th century and settled on Chehalem Mountain, southwest of Portland. 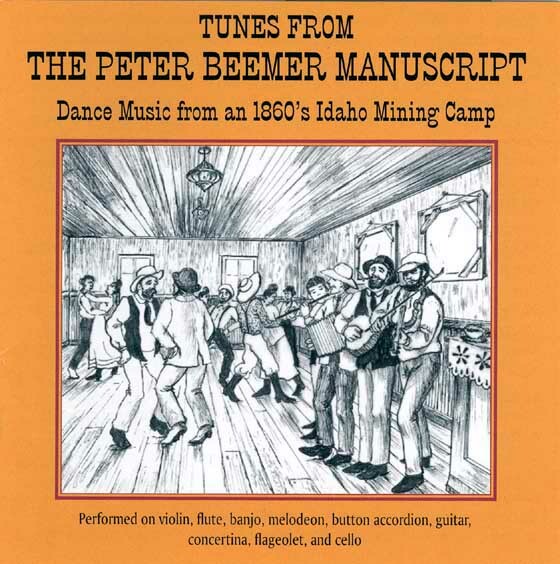 The manuscript gives a fascinating glimpse into the music played for community dances in the pioneer West. The CD includes 26 tunes from this manuscript, including waltzes, polkas, schottisches, a gallop, and three quadrille sets arranged to fit standard quadrilles (square dances) of that time. 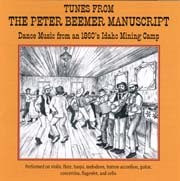 Five tunes in this manuscript also are in The Peter Beemer Manuscript (see above), showing that these were the common dance tunes of that era in the Far West. The tunes are quite different from what historians have assumed were played here for community dances. While they were being played by common folks - millworkers, farmers, miners, orchardists - many of them require classical training to play. The tunes are performed on violin, piano, guitar, and flugelhorn by a trio of musicians who have play dances together - square, contra, and ballroom - for over twenty years, and who are among the best performers of 19th century popular dance music, particularly the dance music of the pioneer Pacific Northwest. See the Liner Notes for more information about this recording.